When it comes to (Scotch) whisky, my heart is divided into two with each of its' halves lying in Speyside and Highlands respectively. But one needs an inspiration from outside one's promised lands sometimes and one needs to depart from his comfort zone into pastures new every now and then. At least once in a while one needs a challenge. 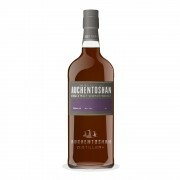 So, it's time for my second (a good deal of months after the first one) bottle Auchentoshan Three Wood Tripple Distilled. Irish ways down south in Scotland, eh? I have read some inspirational reviews (@markjedi1 and @rigmorole, I'm looking at yours, as a very different, but equally inspirational ones) on this one so I decided to give my humble two pence of worth. I have owned a bottle of this dram many months before and my memories are fond and warm, but I remember that some of my friends and acquittances said they've found it too hot, too woody and somewhat harsh on the palate. So, let me revisit this one for my own pleasure and for contribution to the network as well. There's some (maybe quite a lot) E150 in Auchentoshan TW, it's visible. It's also stated at the label at the back of the bottle. Beautiful color nevertheless, although meaningless for the overall mark. Having said that, the shape of the bottle somewhat reminds me of the bottle of Singleton Of Dufftown 12 Year Old scotch. Let's hope this dram doesn't taste like SoD (bland and meek) and that it will be as much fun as the bottle I've drank to the last drop so gladly in the past. Nose: sherry, cherry, cinnamon, oak. An orange peel hint. Freshly sharpened pencils. Autumn leaves. Sandalwood?! Oh, I adore sandalwood and this is the most unusual place to find it. How did I miss that the last time around? Have I been sleeping or something. A magic, woody nose! A nose that is willing to show you not the forest, but the forest Driads' dark secrets from within the wood's trunk. A very untraditional, but otherwise divine nose. Palate: This one is heavy. It isn't smooth, nor delicate. This is a man's drink, even at 43%ABV. But I am a man's man, so what the hell? Sherry and very fresh oak all over the place. Robusta and Arabica coffee blend. XO Camus French cognac. Cinnamon. Oriental spices and wood, Wood, WOOD,. One gets the feeling that an oak has been cut down to shreds and glued to one's mouth using dark chocolate with pieces of orange instead of glue. Finish: absurdly long and spicy, developing from cinnamon to sandal wood. MORE sandal wood. From sweet milk chocolate to grounded, unsweetened cocoa. A remarkable and unforgettable bitter-sweet-sour aftertaste. The wood lingers on and on. Hell, I felt it even after hours! Complexity: this Auchentoshan dram combines spectacularly almost all of MY favorite scents, so I feel tempted to rate it very high. However, I need to try and be as objective as possible. This is not a very complex dram. It isn't multidimensional. It just promises something, not all, and delivers it devotedly. Gives as much as it is able to, but it isn't almighty. It also is NAS, has artificial coloring etc. This is not a typical, an IDEAL scotch. It is far from it! It would have had more complexity if it were to offer more floral notes and cask strength. It is an experiment, after all (triple distilled), it is colored, it boasts three finishes. It doesn't go smooth at all. It could be better off if bottled at cask strength. These flaws prevent it from going postal and way above the 90 mark in my book (which it should have if I wasn't trying to be as objective as possible). Will I buy Auchentoshan Three Wood again? Damn, I'll even buy 2 bottles of this spicy man's drink! I cannot stress hard enough how much I like it. Will I wholeheartedly recomend it? Yes. Is it for everybody's taste? Hell no! That's why it will stay very close to the 90 point range - because it is not a universal truth. Only mine. Lovely review. I've not had a chance to try it but I love the analogy of sticking wood to one's mouth using chocolates and orange peel. Very nicely put! @Magnus Thank you so much for your generous offer! I'll pick up one up soon! Interesting take. I had written off the three wood after reading quite a few very average reviews. Perhaps I'll have to reconsider. @broadwayblue, I guess you'll pretty much have to. Maybe it's getting better. I might try it again.